Creek-side woodlands are among the Los Angeles areas where mountain lions hunt for prey. Los Angeles is one of only two megacities — Mumbai, India, is the other — where large predatory cats live among us, and they’re closer to human development than you might think. Mountain lions are rarely seen, but they occasionally prowl near human habitats, according to a study by UCLA and the National Park Service published today in PLOS One. 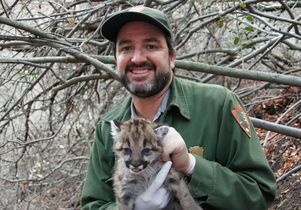 The research, conducted in and around the Santa Monica Mountains, is the first of its kind to investigate where mountain lions like to hunt in highly urbanized areas. Using locations identified by GPS radio collars and field observations, researchers determined the favorite hunting grounds of the region’s mountain lions. They found that males tend to stake out woodlands near creeks and rivers. Females, on the other hand, made kills a little less than a mile away, on average, from human development. Females probably choose such areas to avoid males, which can be deadly to them and their kittens, said John Benson, the study’s lead author and a wildlife biologist at UCLA’s Institute of the Environment and Sustainability. Both sexes also probably selected hunting grounds based on the availability of mule deer, their main prey. Benson said deer are attracted to areas with water and lush vegetation. This could explain why males hunt in forests near creeks and rivers. It might also help explain why females hunt closer to human development, where sprinklers, swimming pools and cultivated gardens are more plentiful. Because they are ambush-style predators, mountain lions tended to hunt in locations with thick vegetation, including steep slopes, lower elevations, upland woodlands and chaparral. In general, mountain lions tended to make kills closer to development than the researchers expected. 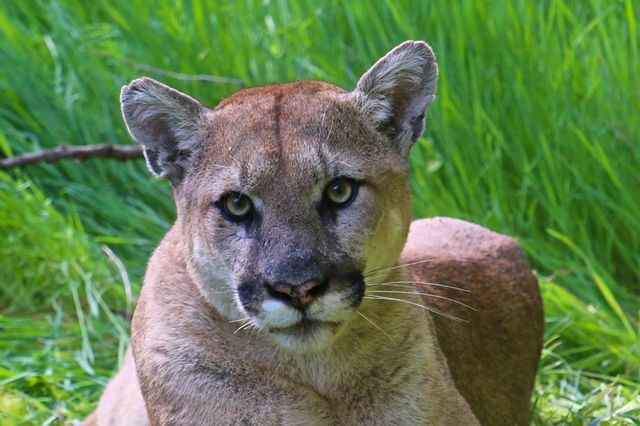 But the more dense the development within a mountain lion’s home range, the less likely that animal was to hunt near residential or commercial areas. When the GPS-tracked animals turned up in the same spot on consecutive nights, it was a good sign that they had caught something — usually deer, but occasionally smaller animals such as coyotes and raccoons. Then researchers examined the site for evidence, usually a carcass. 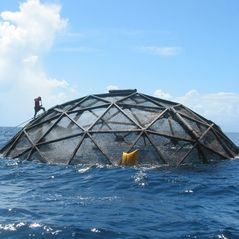 While the finding that kills were made closer to development than expected was surprising, only two kills of 420 were recorded inside developed areas. Unfortunately, the Los Angeles mountain lions’ existence in urban areas, reflected in Steve Winter’s iconic photo of Griffith Park’s beloved P-22 in front of the Hollywood sign, comes at a cost to their health and safety. Researchers named the animal P-22 when he was caught and tagged as a 3-year-old in 2012. Two years later, he was treated for severe mange, believed to be due to rat poison exposure. And in August 2015, a juvenile male known as P-32 was hit by a vehicle and killed while attempting to cross Interstate 5 near Castaic Lake. Mountain lions are generally abundant in the American West, so they are not protected under the Endangered Species Act, though California passed a law in 1991 that prohibits hunting them. The risk isn’t limited to poison, cars and loss of habitat — inbreeding may pose the biggest threat of all in the long run. 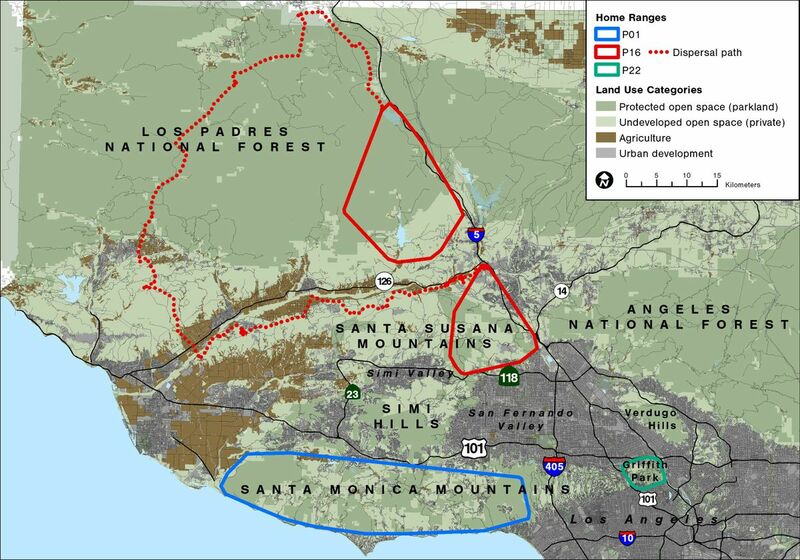 The 15 or so cats that live in the Santa Monica Mountains are isolated by the 405 and 101 freeways, which cuts them off from outside populations and limits their genetic diversity. Inbreeding potentially reduces survival and reproduction, which can lead to a population's extinction. The most promising solution to the inbreeding problem would be construction of a wildlife bridge over eight lanes of the 101 freeway, but that's no small task. Another problem is future development. 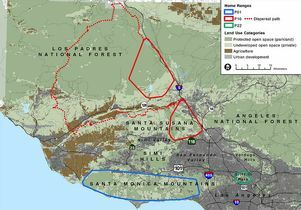 The National Park Service oversees 150,000 acres within the Santa Monica Mountains National Recreation Area — a patchwork of protected federal, state and local lands. 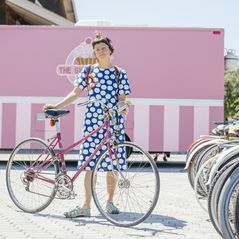 But nearly half of the recreation area remains privately owned and, as the value of Los Angeles real estate continues to rise, more new homes could be built. 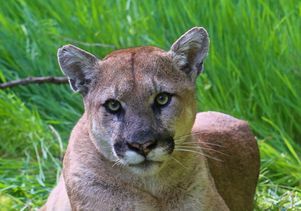 For now, the Los Angeles region’s mountain lion populations are stable, neither growing nor shrinking. And despite tragedies from poisoning and automobile accidents, there are some successes, too. Just last month, two new litters of kittens were discovered north of Los Angeles in the Santa Susana Mountains. As they grow, P-48 through P-52 will join the urban world of the city’s big cats.